Top business executives on Monday condemned racism and extremism after a rally turned deadly in Virginia. Apple CEO Tim Cook called white supremacy and racist violence "a moral issue -- an affront to America" in a tweet. "We must all stand against it," he wrote. Goldman Sachs CEO Lloyd Blankfein, meanwhile, quoted President Abraham Lincoln: "'A house divided against itself cannot stand.' Isolate those who try to separate us. No equivalence w/ those who bring us together." Their statements came after white supremacist and alt-right groups descended on Charlottesville, Virginia and clashed with counter-protesters. 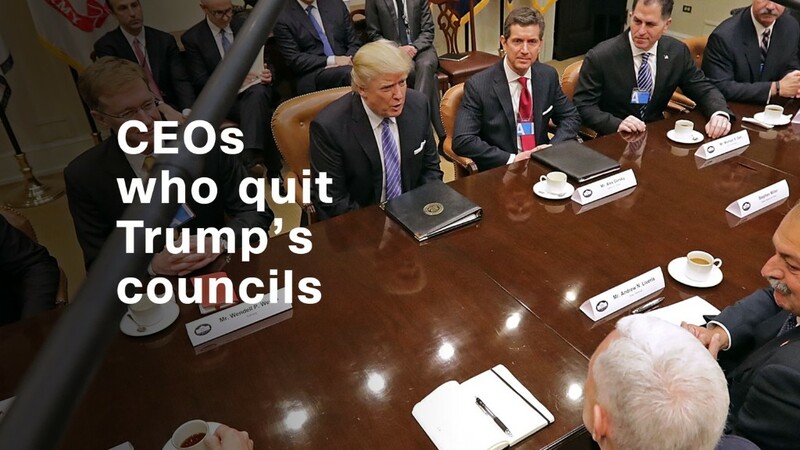 But the most drastic action from a business leader came early Monday, when Merck (MRK) CEO Kenneth Frazier, one of the country's most prominent black corporate executives, quit President Trump's manufacturing council. "America's leaders must honor our fundamental values by clearly rejecting expressions of hatred, bigotry and group supremacy," Frazier said. Trump on Saturday spoke against bigotry and violence "on many sides" but did not specifically condemn white supremacists. It wasn't until Monday afternoon that he bluntly called "KKK, neo-Nazis, White Supremacists, and other hate groups ... repugnant to everything we hold dear as Americans." Hours before Trump made that speech, he bashed Frazier on Twitter. About an hour after Frazier left the council, Trump tweeted that the executive "will have more time to LOWER RIPOFF DRUG PRICES!" Paul Polman, CEO of Unilever, tweeted his thanks to Frazier "for strong leadership to stand up for the moral values that made this country what it is." And General Electric released a statement saying the company has "no tolerance for hate, bigotry or racism." "We strongly condemn the violent extremism in Charlottesville over the weekend," the company said. It added that GE chairman Jeff Immelt will remain on Trump's manufacturing group, citing an importance for GE to "participate in the discussion on how to drive growth and productivity in the U.S."
Under Armour CEO Kevin Plank said through his company's Twitter account that the company supports "love and unity." "We are saddened by #Charlottesville," Plank's statement read. "There is no place for racism or discrimination in this world." Intel CEO Brian Krzanich tweeted that "there should be no hesitation in condemning hate speech or white supremacy by name. #Intel asks all our country's leadership to do the same." Richard Trumka, the president of the AFL-CIO, said Sunday that leaders, starting with the president, should acknowledge Charlottesville for what it was: "domestic terrorism rooted in bigotry." And Dow Chemical Chairman and CEO Andrew Liveris said there is "no room for hatred, racism or bigotry" at his company. Plank, Krzanich, Trumka and Liveris are also on the president's manufacturing council. None said whether they would stay on. Stephen Schwarzman, the chairman, CEO and co-founder of Blackstone, said "Bigotry, hatred and extremism are an affront to core American values and have no place in this country." Schwartzman chairs the White House's Strategy and Policy Forum, a group of business executives who were tapped to advise Trump on the economy. He did not address his involvement in his statement, but cited Trump's newest remarks about Charlottesville on Monday. "As the President said today, I believe we need to find a path forward to heal the wounds left by this tragedy and address its underlying causes," he said. Pepsi CEO Indra Nooyi, a member of Trump's economic advisory group, tweeted Sunday that she was "heartbroken by the violence in #Charlottesville." "Hate and intolerance are a betrayal of what we stand for as Americans," she said. --CNNMoney's Ahiza Garcia, Shen Lu and Tom Foster contributed to this story.